Something happens when we start making maps of hitherto unknown terrain. A sense of familiarity begins to settle in, a pre- and post-visit linearity, even when the landscape is billions of miles away. To put a name on a place and put that name on a map is a focusing that turns a bleary imagined place into a surface of mountains and valleys, a place that from now on will carry a human perspective. It can’t be undone; a kind of wave function has already collapsed. And what place more remote than Pluto? At the dwarf planet’s Tenzing Montes, we find striking peaks, some of them running up to 6 kilometers in height, and all this on a world that, until 2015, we weren’t sure even had mountains. Certainly we weren’t expecting mountains this tall, or a terrain this rugged. Given how many years may pass before we have another chance to visit Pluto/Charon, these first official validated topographic maps of the dwarf planet and its moon, just released, will carry our science — and our imaginations — for a long time to come. Image: Perspective view of Pluto’s highest mountains, Tenzing Montes, along the western margins of Sputnik Planitia, which rise 3-6 kilometers above the smooth nitrogen-ice plains in the foreground. The mounded area behind the mountains at upper left is the Wright Mons edifice interpreted to be a volcanic feature composed of ices. Area shown is approximately 500 kilometers across. Image credit: Lunar and Planetary Institute/Paul Schenk. The maps are the work of New Horizons researchers led by Paul Schenk (Lunar and Planetary Institute). The team examined all the images from New Horizons’ Long Range Reconnaissance Imager (LORRI) and Multispectral Visible Imaging Camera (MVIC) systems as the raw material for their mosaics. They aligned surface images where they overlapped and performed digital analysis of stereo images both cameras acquired, producing topographic maps for each region, then assembling these into integrated topographical charts for both Pluto and Charon. Pluto’s mountains are likely made of water ice, because ices from volatiles like methane and nitrogen would not be strong enough to support such tall features, and as the images show, the steep peaks along the southwestern edge of Sputnik Planitia, itself a frozen sheet of nitrogen, have slopes pushing 40° or more. The topographical maps put large-scale features into perspective and help us see both Pluto’s and Charon’s surfaces in a broader context. Sputnik Planitia is a good example. Fully 1000 kilometers wide, it contains an ice sheet that averages 2.5 kilometers below Pluto’s mean elevation, which corresponds to sea level on our own planet. The maps also show us that the outer edges of the sheet are an even deeper 3.5 kilometers below mean elevation. These are the lowest known areas on Pluto, a fact that emerges only through study of the stereo images and subsequent elevation maps they spawned. The deep ridge-and-trough system running north to south near the western edge of Sputnik Planitia is more than 3000 kilometers long, evidence for extensive fracturing, as this LPI news release explains. It is the longest known feature on the dwarf planet. And then there’s Charon. Who would have dreamed in 1978, when astronomer James Christy discovered it, that we would ever have the kind of detail that shows below? Image: Perspective view of mountain ridges and volcanic plains on Pluto’s large moon Charon. The ridges reach heights of 4 to 5 kilometers above the local surface and are formed when the icy outer crust of Charon fractured into large blocks. The smoother plains to the right are resurfaced by icy flows, possibly composed of ammonia-hydrate lavas that were extruded onto the surface when the older block sank into the interior. Area shown is approximately 250 kilometers across. Image credit: Lunar and Planetary Institute/Paul Schenk. In my first paragraph today, I summoned quantum mechanics for inspiration, saying that producing maps created the collapse of a kind of psychological wave function. Adam Alter made the same point a few years back in an article in The New Yorker, where he talked about our association of linguistic labels with the things they denote. The effects can be subtle. Northerly movement, for example, is associated in psychological testing with going uphill, apparently a remnant of the decision of ancient Greek mapmakers to put the northern hemisphere above the southern one. Alter goes on to speak of what he calls a ‘linguistic Heisenberg principle,” meaning that as soon as you label a concept, you change how people perceive it, and I would assume this goes for landscapes as well. So we’d better choose the place names we put on our maps with care, given the freight they carry in our imaginations. Ray Bradbury knew this as well. His ‘The Naming of Names’ takes Earth colonists on Mars to strange places indeed as they begin to name the places they see. The nights were full of wind that blew down the empty moonlit sea-meadows past the little white chess cities lying for their twelve-thousandth year in the shallows. In the Earthmen’s settlement, the Bittering house shook with a feeling of change. It’s a great tale, and one worth re-reading any time mapping new landscapes comes to mind. The papers are Schenk et al., “Basins, fractures and volcanoes: Global cartography and topography of Pluto from New Horizons,” Icarus Vol. 314 (1 November 2018). abstract; and Schenk et al., “Breaking up is hard to do: Global cartography and topography of Pluto’s mid-sized icy Moon Charon from New Horizons,” Icarus Vol. 315 (15 November 2018). Abstract. Adam Alter’s “The Power of Names” appeared in The New Yorker’s May 29, 2013 issue. Someday there will be a station in Tombaugh Station in Tombaugh Regio. O my! Shades of Wilson Tucker. Tucker, well known as an SF fan, but a master SF writer, who is , alas, unjustly unknown (mostly). Thinking of Pluto always takes me back to that Niven story, the one where a stranded astronaut freezes, only to find that his nervous system has become superconducting and that he can still think, frozen solid. He watches the stars, but sunrise heats him and shuts down his mind, until night, where he wakes again. It’s a great tale, called ‘Wait It Out.’ I still remember the night I read it. For me, while I loved “Wait it Out”, the reference is “Have Spacesuit, Will Travel” by Heinlein. 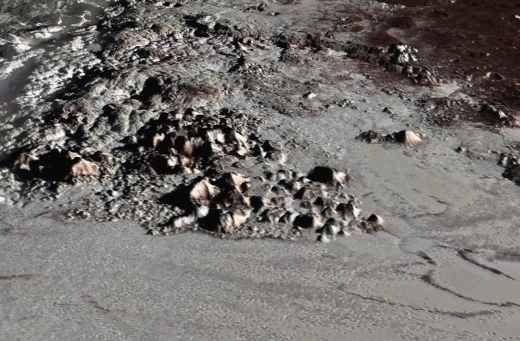 The story includes a volcanic eruption on Pluto, and now, while we can’t say just what they look like or how frequent they are, cryovolcanism on Pluto is a near-certainty. Nice point! I had forgotten about “Have Spacesuit, Will Travel” in this context. Has anyone ever tested whether freezing a brain to near absolute zero turns them into a functioning superconductor? Names are symbols in sound, or represented as text. Symbols convey information, affecting thought processes ranging through perceptions, cognitions and emotions. What the symbols represent might be categorized along a spectrum from abstract to concrete. All of these can and do vary over time with circumstance. While the naming of objects is intended to offer a handle on describing the named, it may also offer much insight into the namer. Is there a non-paywalled version of the article somewhere? Frank, I haven’t found one, but maybe one of the readers has. Many links … txt, pdf and html. Meanwhile, a 1987 radio broadcast of U2’s “Where the Streets Have No Name” pushes outward 31 light years from Earth, as the bounds of what has been explored, what has been named but not explored, and that which yet remains unnamed and unexplored also pushes ever outward. If the sum total of the known be compared to the volume of a sphere, the the “unknown unknown” lies outsside, and the “known unknown” is the surface of the sphere. Increassing knowledge by the third power increases recognized ignorance by the second power, creating in some the illusion that omniscience might be approachable or even reachable. I know that top picture is 500 km across approximately but I cant help but look at the image and think it could be some barren place on Earth worthy of adventuring to someday, with it’s own plains and mountains and boulders and dirt or whatever … and then to think that it’s on Pluto … I mean no “mind blown” meme will suffice here, it’s just truly astonishing. Makes me feel alive with wonder and gratitude to have even seen a picture like this of a body such as Pluto … so infinitely beyond my reach. Just a teaser for Icarus to collect monies for data that belongs to the tax payer.. Dont expect Tax payers and non astro professionals to wade thru the PDS maze and hunt for data.. After all its just Maps, that can be put on arxiv website.. Lets all Pluto-holics and astro lovers enjoy the analysis from their tax funded missions an no additional cost.. The names should make sense for their world, given its mythological namesake’s attributes, and/or its physical character. For example, it was once planned to name the surface features of Mercury after birds, which made little sense for a world with all but no atmosphere! :-) Cytherean features (on Venus) are named for goddesses and famous women, except for the Maxwell Mountains (named in honor of the physicist whose theory of electromagnetism enabled the radar mapping of Venus much later) and Beta Regio, an originally Earth radar-detected volcanic feature. Many of Io’s surface features are named after characters in Dante’s “Inferno,” befitting that moon’s hellish, molten sulfur volcanic nature. Another chance to visit the Pluto system could come sooner than many think. Planetary scientists are currently in the early stages of working on a Pluto orbiter, which would enable us to map all of Pluto and Charon and learn more about their moons. Pluto is one of many solar system worlds that may have a subsurface ocean that could support microbial life, so it is definitely worth going back. I imagine the human eye located at the camera viewpoint would see a very dim image. Still, amazing to see what the surfaces look like. According to the reference below, Pluto sunlight levels are higher than a night-lit sidewalk, lower than a typical public indoor bathroom. The human eye has a high degree of automatic gain control and wide dynamic range, so apparently, you could see … not that I expect anyone to try that soon! I don’t think anyone should ever use a public restroom in any venue to describe anything, especially astronomical. Far more frightening than the most remote and inhospitable alien world possible. Interesting comment about collapse of the wave function, the idea is the basis of Taoism. Culture put language and symbols on the world but to really see you must raise above that ans see it as it really exist. How many times have you seen something that you could not understand until you could put it in context, then it was very obvious what it was. Mentioned recently was how children may be better at understanding alien languages and symbols for just this reason – adults filter out a huge amount of the information we receive, We miss what may be the important part of the message. The radar images of asteroid 2017 YE5 of a binary with both of them the same size, reminds me of Rocheworld by Robert Forward. Beloved astronomer Guy Ottewell announces his newest book. You must check out the diagrams and charts in this article! Why does a world 3 billion miles from Earth on average and smaller than Luna have terrestrial-like glaciers?